Get More Leads With Premium Content! The vast majority of the visitors in your site (around 96%), aren’t there to convert into customers. If you want to capture some of those leads that are slipping away, you may want to consider premium content to attract those visitors. A typical “Free Quote” Call to Action (CTA), won’t do the job: they are people in the research stage of the buying process and those “pushy” CTAs aimed at sales ready visitors don’t work on them because they’re not sure that they want to work with you yet. So, let’s back it up a bit. As you know, a site is a great platform to reel in potential customers. The most common way to do it is through a Call to Action (CTA). These are buttons, text or links with actionable elements that will prompt visitors to take an action that will get them closer to conversion.Your phone number in your site, for example, can be considered a call to action. Another example would be a “Free Quote” button that’s aimed at visitors that are ready, or close to, taking that step (like the one in the image below). Premium content is a secondary CTA that delivers valuable information that can be traded off in exchange for that visitor’s information. This way, they’ll feel like you’re providing value to them in that research stage and giving you their information won’t be as harsh and intimidating. This can be done in the form of downloadable goods that they could be interested in and that they can “take away”. If you’ve put together a really comprehensive ebook on tips for insurance, you can provide it as premium content so the user will have to fill out a form before actually getting it. And you’ve captured an interested lead right there! What’s more, if that piece information is valuable enough, the moment that lead needs to convert, they’ll probably come to you! An e-book, is an electronic publication that pretty much resembles a book. This come with different implications: it needs to have a certain length, it’s made up of mostly text and images and it needs to be original material. With an e-book, you could put together a comprehensive guide that help readers with something related to your business. This can be great for insurance agents. Since you work in the professional services field, an e-book could be an exceptional instrument to communicate your knowledge in the matter and start gaining prestige in the business. You can go over various related topics to fully explain a situation! 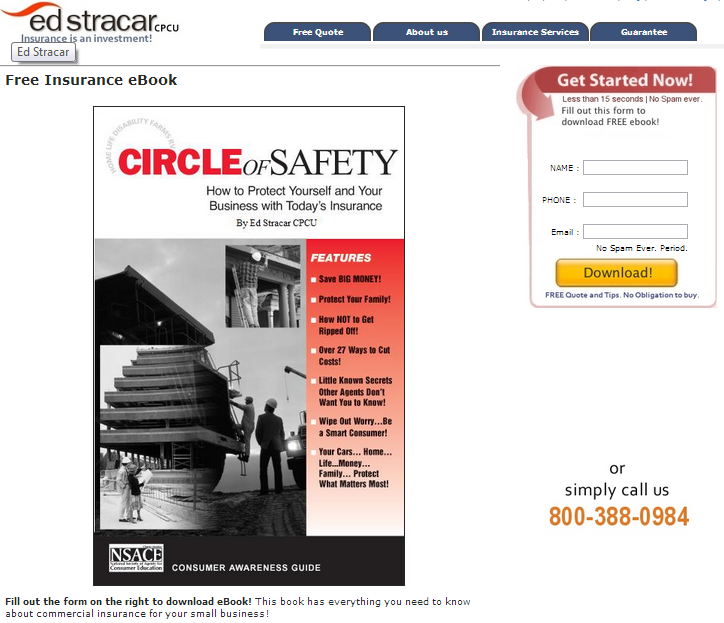 In this next example, you’ll see that, in order to get that free E-book on “How to Protect Yourself and Your Business with Today’s Insurance”, you’ll need to first, fill out the download form to the right. This way, you get a new lead and they get valuable information. If you have a content marketing strategy, you may have already started writing articles. But, if you have a topic that you know could capture the attention of those visitors who are just looking around, you should consider giving it a premium content status. Articles can be perfect to provide value because it goes over a specific topic in a readable and friendly way, which can engage your leads with your business. Whether it’s “Do’s and Don’ts”, “Top 10” or “Tips & Tricks”, make sure your premium content is good and attractive enough so your visitors may want to become a lead in order to get it! Checklists are easy to do and fun to read. They can be informative by providing a list that your visitors can go through to make sure they are on the right track in a certain topic related to your business. A checklist to “Know if you’re paying the right amount for health insurance” is compelling, helpful and an attractive subject. It’s a win-win situation! A white paper is another great alternative to gain authority in the field. It’s a comprehensive paper that gives advice on certain insurance-related topics. 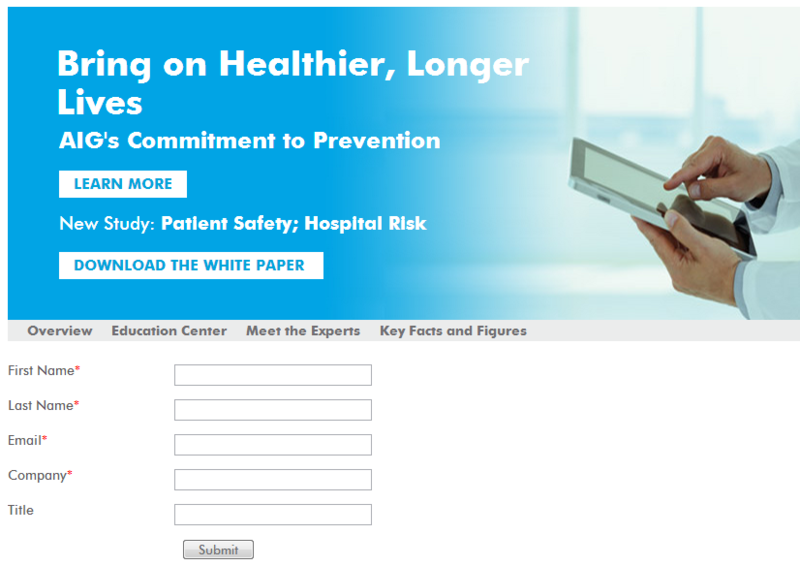 In this next example, this insurance agency give out tips on hospital risk. Obviously, this topic is right up their alley since they provide their clients with health insurance. As you can see, in order for visitors to learn more about patient safety, they’ll first have to fill out the form below. Premium content in action! As an insurance agent, it’s more than likely that you’ve been to or have given a seminar to a group of people. A webinar, as the name implies, is a web conference given to a group of people through video chat. More often than not, webinars are later posted on YouTube for others to watch. Still, you could take advantage of this opportunity and offer your workshop or lecture as premium content. Put together a compelling presentation and allow visitors to download it in exchange for their information. Now the same old question: “What to write about?”. Content inspiration is hard to come by and it can be increasingly difficult if it needs to be interesting enough to fill the ‘premium content standards’. All in all, it can be easier said than done, so here are some pointers that you may find useful! Think about topics that can transcend the “time” barrier. Unless you want to be updating your premium content regularly, you may want to focus on subjects that can be understood and useful despite of the context. They need to be timeless and stay relevant for long periods of time. Take some of your biggest tips & tricks and make them premium content! Think about what’s concerning your clients: what are they asking you? what do they need? Make them feel like you value them by sharing valuable information! Think of customization! Don’t produce generic but important topics; bring them down to a level where your visitors will want to read them. Make it about the town you work in, the interests your clients have, among other things. Give the content personality and relatability! If you need more help with content inspiration, you can check these posts on ideas for Health, P&C and Life insurance agents. Remember to follow these pointers and give your subject that extra spin to make it interesting, different and appealing. Make the most of your site with premium content! Not every visitor is there for the same reasons, so don’t try to treat them the same way. If you want to take advantage of the amount of traffic coming into your site thanks to your content marketing strategy, be sure to add a secondary CTA that will capture the attention of those who aren’t ready to buy (yet!). Remember that these are leads that are interested in your business but need a bit of time and nurturing before becoming your client. So, in the long run, appealing and informative premium content will bear great results for your business! Feel free to ask any questions about this post or Empowerkit in the comments section below!